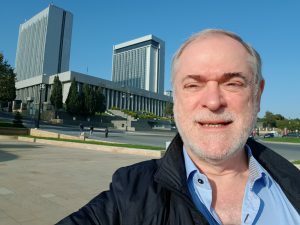 On the invitation of Natig Shirinzade, Chairman of the Institute of Global Economic Problems, the President of the Global Labor Organization (GLO), Klaus F. Zimmermann, has visited Baku, Azerbaijan, on 10-13 November 2018 to discuss research and policy issues and to intensify contacts. Chairman Natig Shirinzade is also a GLO Fellow and the GLO Country Lead Azerbaijan representing GLO. MORE DETAILS. Organized by Natig Shirinzade (right side of the picture), Zimmermann met with researchers and scientists, representatives from business and government including members from the office of the First Vice President of the Republic of Azerbaijan, the Executive Director of the State Oil Fund and his staff, the Minister of Labor and the Minister of Education with their staff, the Chairman of the Economic Policy, Industry and Entrepreneurship Committee of the National Assembly, and the Deputy Foreign Minister and Founding Rector of the Azerbaijan Diplomatic Academy (ADA University) with various administrators and professors from ADA University and the Azerbaijan State University of Economics. 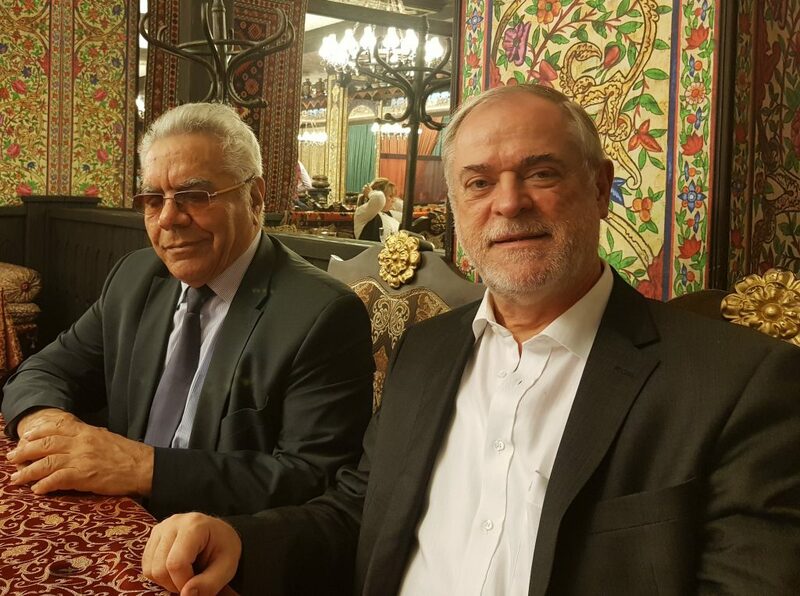 A highlight of the visit was a meeting with the Honorary Academician Ziyad Samedzade, the Chairman of the Economic Policy, Industry and Entrepreneurship Committee of the National Assembly (Milli Mejlis). 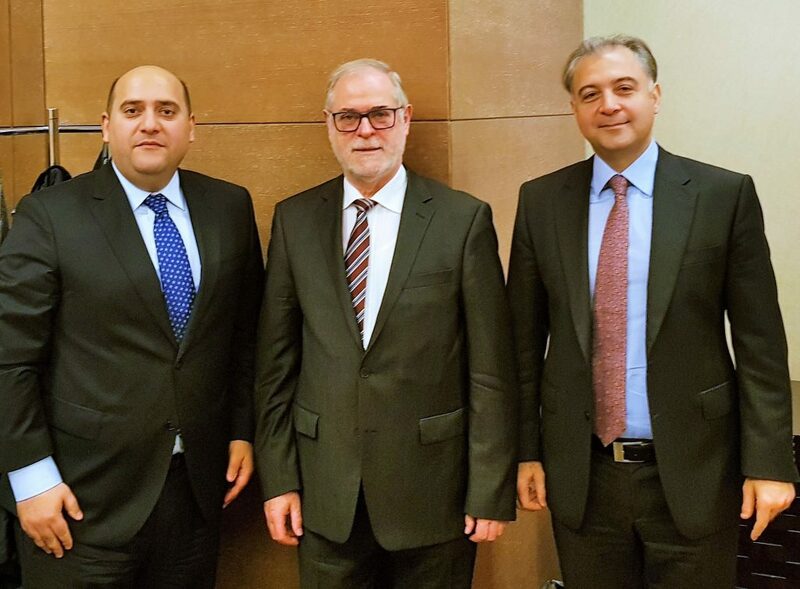 Meeting with Emin Huseynov, Assistant First Vice President of the Republic of Azerbaijan and Khalid Ahadov, Assistant First Vice President of the Republic of Azerbaijan. 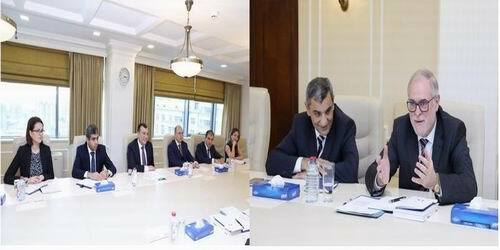 Shahmar Movsumov, Executive Director of the State Oil Fund of the Republic of Azerbaijan and his staff. Sahil Babayev, the Minister of Labor and Social Protection of Population of the Republic of Azerbaijan and his staff. 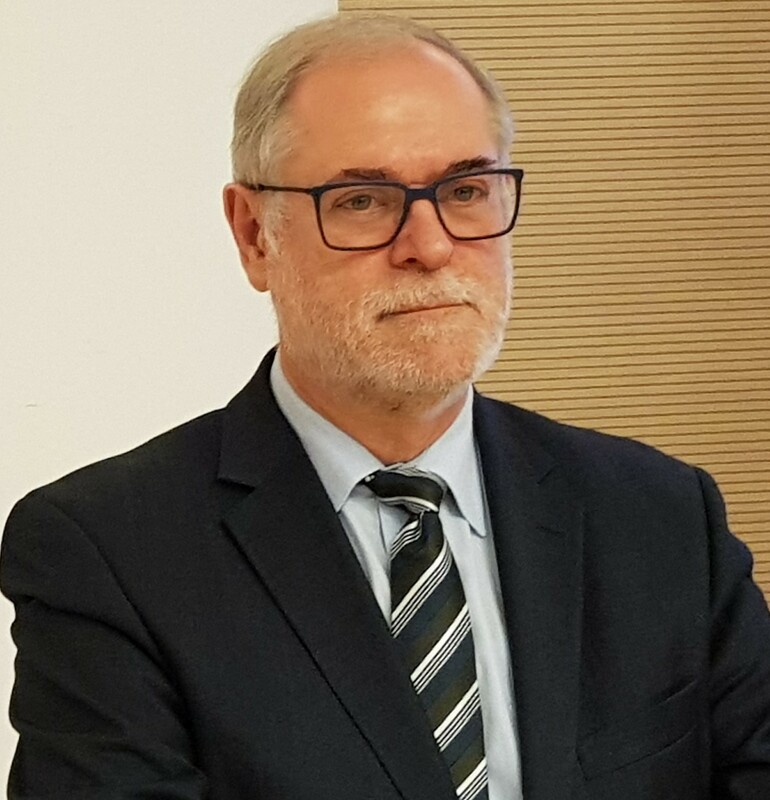 The Honorary Academician Ziyad Samedzade, the Chairman of the Economic Policy, Industry and Entrepreneurship Committee of the National Assembly (Milli Mejlis). Ceyhun Bayamon, the Minister of Education of the Republic of Azerbaijan and his staff. 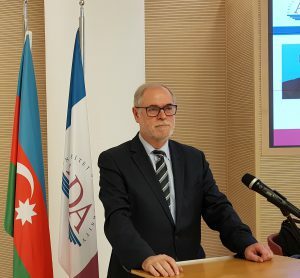 Professor Hafiz Pashayev, the Deputy Foreign Minister and Founding Rector of the Azerbaijan Diplomatic Academy (ADA University). Public Lecture for ADA students on “Human Challenges and Solutions at Times of Rapid Global Changes” in the ADA Global Perspectives Lecture Series on November 13, 2018. Excellent and deep discussions with key staff members of the office of the First Vice President of the Republic of Azerbaijan, First Lady Mehriban Aliyeva: Emin Huseynov (left) and Khalid Ahadov (right). Broad and common understanding about the global human challenges and the large potentials for deeper collaborations between Azerbaijan and Europe. With Shahmar Movsumov as the Executive Director of the State Oil Fund of the Republic of Azerbaijan, the Fund prepares for the future of the country investing resources around the world and supporting the change of the country including activities strengthening infrastructure and human resources. 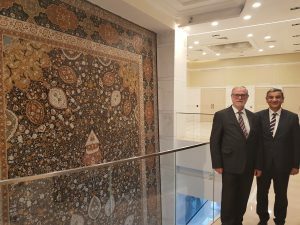 Both Natig Shirinzade and Klaus F. Zimmermann were visiting Shahmar Movsumov and his staff in his headquarter to introduce the respective institutions and to discuss the research needs to deal with the major challenges of the country. Bellow: In the headquarter of the Fund. In both ministries, labor and education, the exchange was about the political strategies to deal with the demand for effective government using the instruments of the digital age, establishing the physical and administrative infrastructure needed for the post oil age, the need to strengthen entrepreneurship and the development of skills and education. A particular need was identified in vocational training, where large efforts of both ministries are under way. 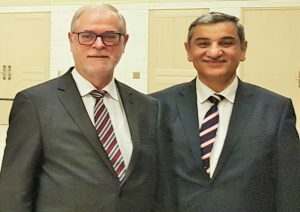 Zimmermann agreed with ministers Sahil Babayev (labor) and Ceyhun Bayamon (education) that vocational training could be key for the development if combined with proper entrepreneurship and small business. He advertised for the German dual system, knowing the difficulties with an adaption of the model that requires long traditions and the strong support of the business community. 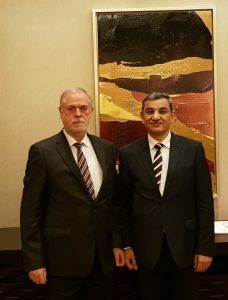 Shirinzade and Zimmermann further met with Ambassador Hafiz Pashayev, Deputy Foreign Minister and Founding Rector of the Azerbaijan Diplomatic Academy (ADA University). At the ADA University, they met with him and Fariz Ismailzade (Vice Rector for External, Government and Student Affairs), Elkin Nurmammadov (Dean of the School of Business), Rahman Shahhuseynli (Director of the Office of International Affairs), Kavus Abushov (Assistant Professor, Political Sciences), all ADA University, and Anar Rzayev, Vice-Rector International Relations and Programs of UNEC, the Azerbaijan State University of Economics. Topics discussed included the mission of GLO, the natural role of the country as a geographic, economic and political meeting point between Europe and Asia, and potentials for academic exchange of the universities with Europe. The visit at ADA University ended with a lecture of Zimmermann for ADA students. 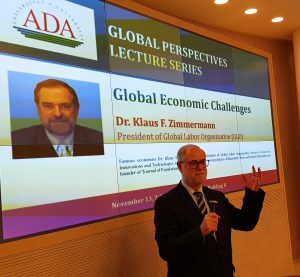 Zimmermann speaking at the ADA University Global Perspectives Lecture Series in front of a large audience of interested students. Klaus F. Zimmermann et al. (2013). Youth Unemployment and Vocational Training. Foundations and Trends in Microeconomics, Vol. 9, 1-157. now publishers.